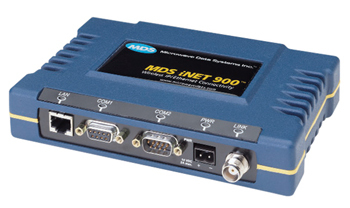 The MDS iNET 900® is a long-range, high-speed, industrial, wireless IP/Ethernet solution. 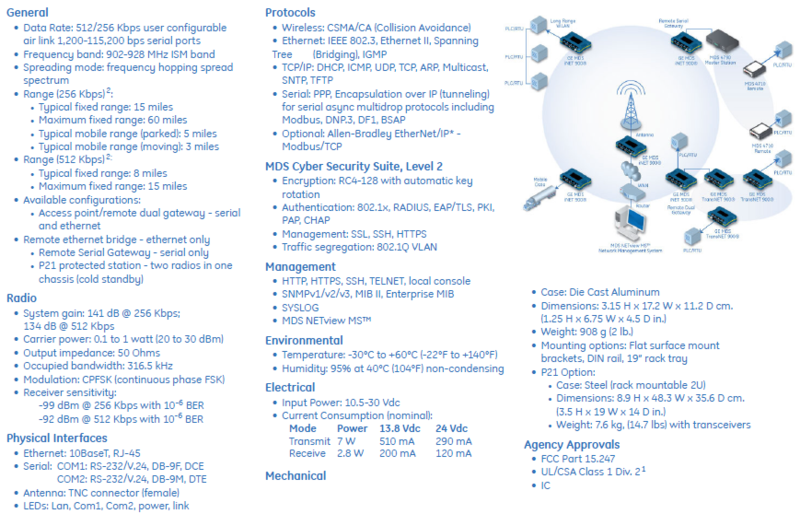 It allows customers to bring business information over Ethernet or a serial gateway and onto IP based networks. This includes mission-critical, revenue-generating data from fixed assets such as oil and gas wells, compressor stations, pipelines, fluid storage tanks and utility meters. It also enables mobile network access for vehicle based operation. 928 MHz ISM band. It is capable of up to 60 mile range (line-of-sight)2 and up to 512 Kbps over-the-air data rate communications. This product is available for use in Class I, Division 2, Groups A, B, C & D hazardous locations. WHY USE AN MDS iNET WIRELESS NETWORKING SOLUTION? Longest range industrial product in its class. Providing lowest cost of ownership. Secure wireless operation with multiple layers of protection, including a 900 MHz physical layer, RADIUS authentication and RC4-128 data encryption with automatic key rotation. Reliable – Designed and built for low failure rates and reduced maintenance costs. Resilient – The P21 protected Access Point (a chassis housing two radios in a cold standby configuration) increases the availability of mission-critical point-to-multipoint networks. P21 Remote stations can also be used to form protected point-to-point links. Flexible – The MDS iNET supports multiple users connecting to multiple applications via multiple protocols on the same MDS iNET unit or the same network – simultaneously! Future proof – The MDS iNET adheres to open standards, allowing it to interface with a wide range of external devices enabling both new and old technologies to communicate. standard off-the-shelf SNMP management system.